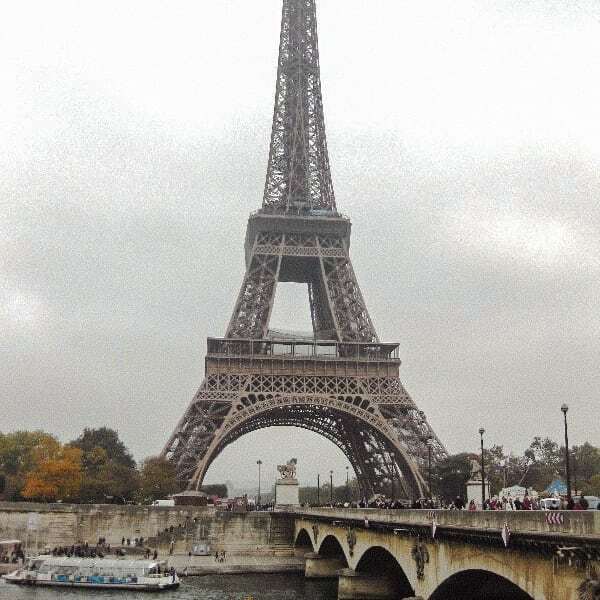 Paris, France is one of the most popular cities to visit in the world. Tourists travel from all over to catch a glimpse of what makes the City of Lights so iconic. 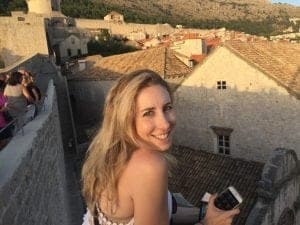 When you visit, there is often a desire to romanticize and idealize the city whether that be with a romantic partner or a group of girlfriends, and I think that is a lot of fun. Building Paris up to be this passionate city is exciting and I believe part of the reason why movies such as Midnight in Paris are so effective. Thus, when planning your Paris itinerary, this idea of glamorizing the city is important to keep in mind. If I am being honest, I did believe “Paris was overrated” the first time I went. I think that was due to a couple of things. First off, I packed in too many sights in one day. Yes, the attractions here are incredible, but hard to appreciate when you can’t even take a second to breathe. Secondly, I was on a backpacker’s budget. Paris is a pricey city and when you can allow yourself to spend a bit more, I do feel like you get more out of it. And this is something I NEVER say about travel, but it was my personal experience in Paris. 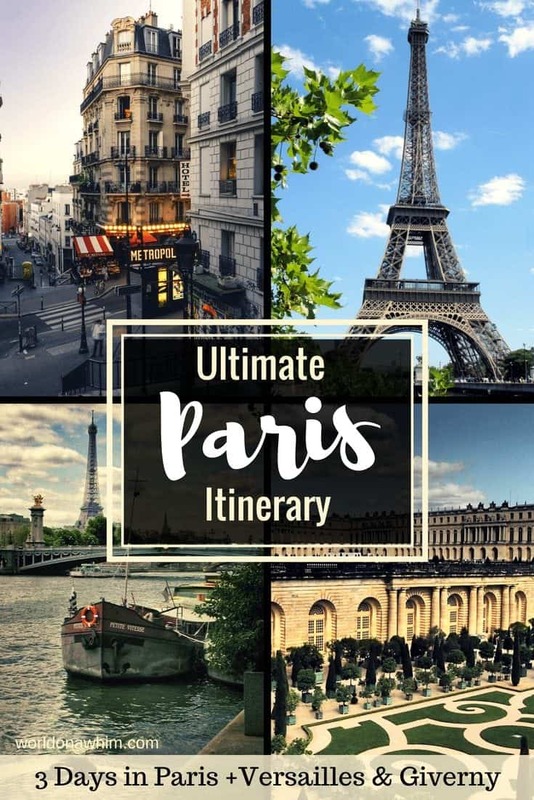 Having been a couple of times now, my goal with this Paris itinerary is to create schedules with timing taken into much consideration as there tend to be long lines at each of the major tourist attractions. I also worked to group attractions together based on location so that this Paris itinerary wouldn’t force you to run back and forth across the city. Finally, I don’t know about you…but I cannot go to more than 1 museum a day–museum fatigue is a real thing–consequently, I made sure to put the Louvre and the Orsay on different days. There are two airports in Paris: Charles de Gaulle (international/domestic) and Orly (domestic/budget airlines) which are both about 45 minutes away from Paris city center. Taxis from CDG are around 50 euro or you can take the RER train for about 10 euro to multiple stations such as Gare du Nord, Chatelet Les Halles and Luxembourg. From Orly, taxis are around 25 euros and there are shuttle buses leaving every 15 minutes from early morning until late evening. Please note: Those Ryanair peeps that think they are getting a good deal flying to Paris Beauvais airport…you’re not. The airport is 50 miles away from Paris and you have to pay for a bus into the city anyway, so pay more for the convenience of Orly or CDG. It is also quite simple to take the Eurostar if you are coming from London. Click here to read my 5 Days in London Itinerary. There are many excellent hotels in Paris including some of the most luxurious properties in the world. This list starts with a palace hotel, but focuses mainly on properties with superior ratings at affordable rates. *Please note that prices listed are for the summer, so if you aren’t traveling to Paris during that time, you may actually be paying less! Le Bristol Paris is one of the highest rated 5* star luxury hotels in Paris and in the world. It is actually so fancy that it is known as being an echelon above 5-star and is officially listed as a palace hotel. The property is in the heart of the fashion, design, and art district and is recognized for its luxurious amenities and service. The hotel has 188 rooms, a pool viewing the Sacre-Coeur and four restaurants. Prices are over $1000 and over $1500 during the summer months. Hotel Fabric is a boutique hotel with 33 guest rooms and is a more affordable option at around $250 a night. The property is a former textile factory and maintains the most stellar reviews. Hotel Fabric is situated between Repubique and Bastille in the 11th arrondissement. and the Saint-Ambrose metro station is about .1 miles away. Astotel: This is a group of 16 3* and 4* design hotels in the 2nd, 8th, and 9th arrondissements in Paris. The hotels offer an open-bar each afternoon, free Wi-Fi and a mini-bar that is available free of charge in all of the guest rooms (nonalcoholic beverages only). Also, you can visit any of the 16 properties during your visit and enjoy the open bar snacks and beverages. Of the 16 properties, I would recommend looking into Hotel Bradford Elysses and Hotel Joke although there are so many with stellar reviews. Prices are generally around $250 a night even during high season! This is great for families who may need to book multiple rooms at affordable rates, but are looking for a quality property in an ideal destination. Hotel Le Littre is a charming 4* star hotel ideally located between Montparnasse and Saint Germain des Pres. I stayed here with my family on my last trip to Paris and it was very lovely. The property is on a quiet street but still close to Paris life. I would recommend upgrading to a room with a view as those are quite spacious with a stunning view of the Eiffel Tower. Prices are anywhere between $200-400 depending on the season. Paris Airbnbs: I strongly urge you to look into staying in an airbnb in Paris. There are certain cities where I would not recommend this, but in Paris especially, I think you can find some great options. I personally love airbnbs because you have your own kitchen and your own space at a much lower cost. BONUS: if you’ve never used Airbnb, get a $40 credit by clicking here. Hostels in Paris: I have all my specifics on Paris hostels in my “Best Hostels in Europe for Solo Travelers & Backpackers” post. Click here to read. We are going to start the Paris itinerary off with a metro ride to the Arc de Triomphe for a sort of inaugural Paris moment. It’s the perfect starting point to get into the Parisian mood and it’s also really fun to watch the cars go round and round on the largest roundabout you’ll probably ever see. Can you imagine taking a wrong turn and ending up on that thing? It’s terrifying and mesmerizing all in one! The Arc de Triomphe is open April to September 10:00 AM -11:00 PM and October to March from 10:00 AM -10:30 PM. There will be multiple viewpoints included on this Paris itinerary; however, the prices to go up to the top of the Arc are quite reasonable for Paris. Its 8 euros for adults, 5 for students, and free for children under 17. The lines aren’t too long either which is always nice because many attractions in Paris feel like you are waiting for a ride at Disneyland sans adrenaline rush. From here, you will want to take a stroll down the main thoroughfare of Paris, the one and only Champs-Elysses. 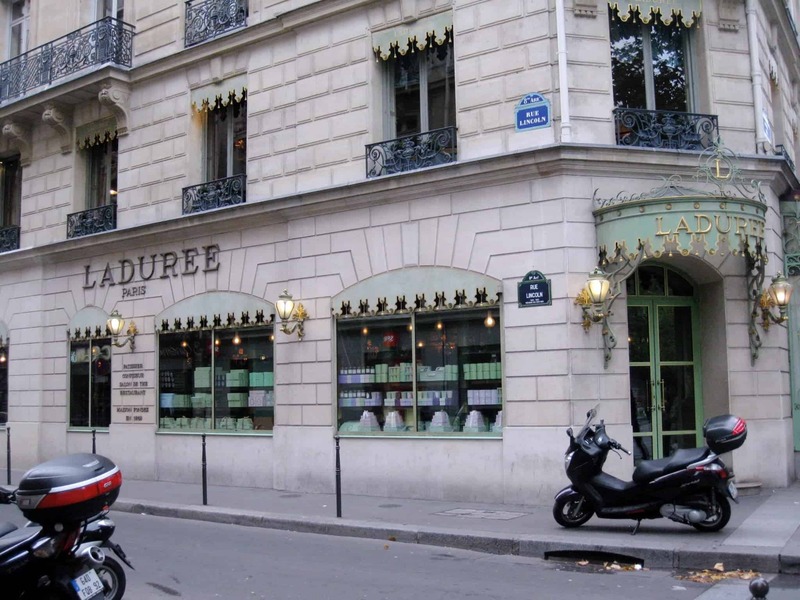 It is entertaining to people watch and browse the Louis Vuitton, Tiffany & Co, and Chanel stores, but I wouldn’t really plan on shopping too much except for some macaroons at Laduree, a 19th century tea salon and pastry shop with the most beautiful facade and elegant interior. Now that they have expanded outside of France into the US and other parts of the world, you have probably heard of or tried the macaroons before, but there is still merit in going to the original, choosing your favorite flavors, and eating them to-go (gasp! so not Parisian) as you walk along the Champs. For those that would like to sit down and enjoy a morning coffee, Le Foquets is a classic establishment on the street as it used to be a coachman’s bistro way back when. Sit on the patio and drink an exorbitantly overpriced coffee that you can sort of justify since you chose to sit at one of the most iconic establishments on one of the most well-known streets in Paris. 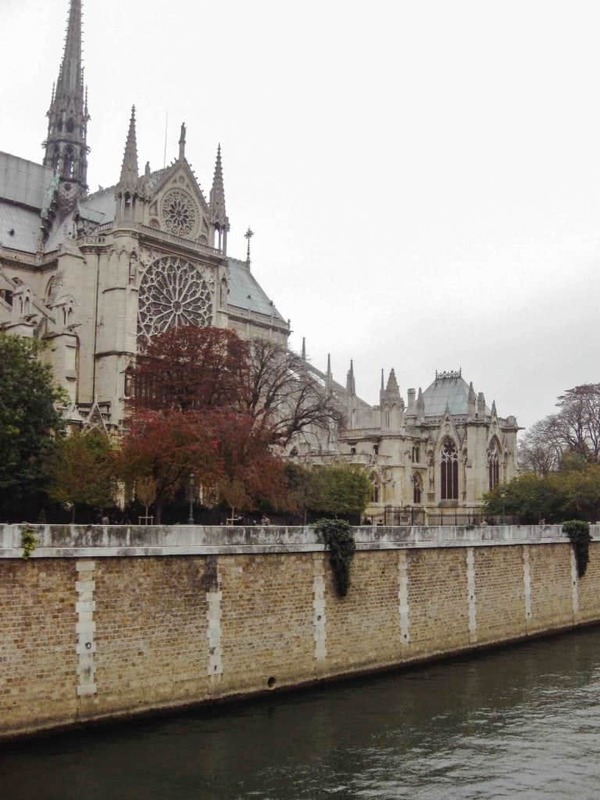 As we started in the 8th arrondissement and slowly made our way toward the Seine River, now would be a perfect time to take a cruise around the Seine. 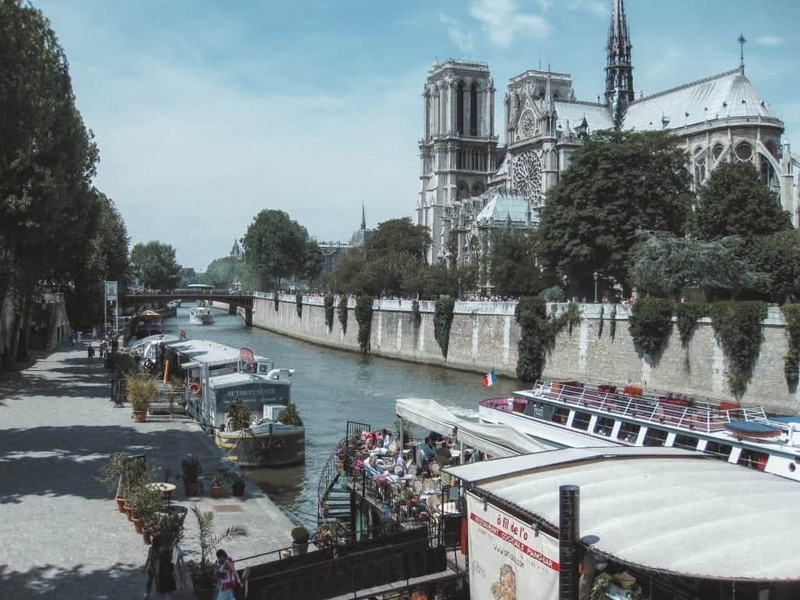 Not only will this give you perspective into the lay of the land in Paris, but you’ll also get some valuable history of the city and of each of the bridges along the way. Bateaux Mouches Seine Cruise, which is the oldest operating company, leaves from Pont de l’Alma in the 8th arrondissement. Think of this as your Hop On Hop Off bus equivalent—it’s a double decker boat with bright orange seats—and the cruise is about an hour long with pre-recorded narration. That probably wasn’t the greatest sales pitch in the world, but if you can manage your expectations and enjoy a touristy, but beautiful cruise for about 13.50 Euro a person, then it’s a great way to get acclimated to the city. There are multiple companies leaving from different departure points as well as options for lunch, dinner, and private events on the boats. Paris is all about walking beside beautiful architecture and eating sweet. Which is why I hope you finished your macaroons quickly and are ready for some more sugar at Angelina, a famous tea house located on Rue de Rivoli. Angelina is known for their Mont Blanc pastry and for having the best hot chocolate in Paris! It’s about 2.2 km away from the river cruise or just a 10 minute bus ride on the 72. The tea house is also right on the edge of the Jardin de Touilleriez (“TWEE-luh-Reehs,” you’re welcome). The garden is not only one of the loveliest in the city, but it is also steeped in French history and is a UNESCO world heritage site. There are two museums on the grounds including the Orangerie museum which hosts Monet’s water lilies series. If you follow this Paris itinerary though, you’ll be visiting the actual water lilies at Monet’s House, so I don’t find it necessary to do both. Enjoy a stroll, strike up a conversation with your travel partner and enjoy this beautiful, historical setting. You’ll also want to rest your feet before the next stop on the agenda, the Louvre, which sits immediately east of the gardens. So I won’t pretend to be a Louvre expert—it took me an hour just to find the exit to the place which apparently is a common problem—it is the largest art museum in the world. But, I do think the museum is less crowded in the evening. It is open 9-6 Monday, Thursday, Saturday, Sunday and 9-9:45 PM on Wednesday and Friday. Keep in mind that the Louvre is closed on Tuesdays. While you’re there, you will want to see the Mona Lisa and I say “see” loosely because the crowds swarming this tiny painting make it near impossible to do so. There is also the famous Venus di Milo but I will stop now because I have no clue what I am talking about and will link to a few sources here and here that may help. 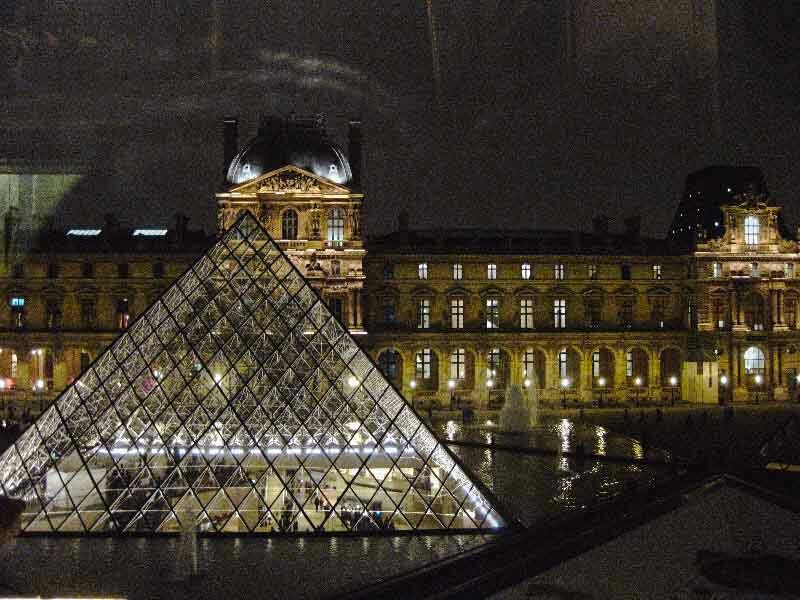 Plan on setting a certain amount of time to spend in the Louvre because you want to avoid burnout. It is impossible to see the entire museum in a day, so either book a guided tour of the highlights, or go in knowing that you’ll see a select number of works of art. There are multiple entrances to the Louvre and the pyramid entrance will generally always be the most crowded. You should try the Palais Royal-Musée du Louvre metro station entrance or the one at 99 Rivoli Street instead. Tickets can be purchased in advance online right from the Louvre website to further prevent a long wait time. From here, dinner is just .7 miles away in the Latin Quarter & St. Germain located in the 6th arrondissement. There is a good chance you may even be staying in this area already because it truly is the place to be. It is a beautiful, trendy neighborhood filled with tons of great dinner options. You can either TripAdvisor a dinner spot, or look at these articles for some inspiration; however, I do recommend making a reservation for about 8:00 PM prior to the start of your trip. We have another action-packed day here people starting off the morning quite early at Ile de la Cite, a natural island in the middle of the Seine river. 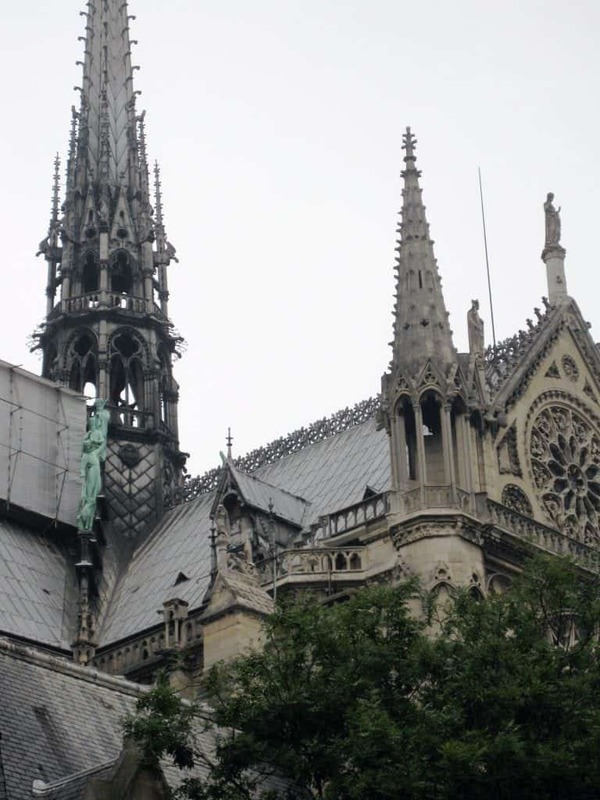 While this island may be small, it contains some of the most prominent tourist attractions in Paris, namely Notre Dame. The Sainte-Chapelle cathedral and the Conciergerie prison where Marie Antoinette was executed are also on this island. Take the metro to the Cite stop which is right in between the two popular cathedrals. There are more scenic ways to get here, but since these attractions are so crowded, why don’t you wait until after you’ve entered and exited these sights successfully and then reward yourself by taking in the views. Sainte-Chapelle opens at 9:00 AM, so if you have an interest in seeing this cathedral, you should plan to arrive 30 minutes before to avoid long lines. Why visit 2 cathedrals in a 2-hour period? Well, the stained glass at Sainte-Chapelle is gorgeous and Notre Dame is Notre Dame. Having lived in Europe, I am a bit cathedral-ed out (def. when you see so many beautiful cathedrals that they all blend together and nothing seems extraordinary magnificent anymore). If you feel similarly, then you could opt to see the Conciergerie (9:30 AM opening time) which is right next to Sainte-Chapelle. Notre Dame – There are 5 potential options when it comes to visiting the cathedral. I am going to lay them out quite explicitly in this Paris itinerary so you can pick and choose your favorites. 1) Explore the interior of the church. Free. 2) Climb 387 steps to the top of one of the cathedrals towers for a beautiful view of Paris. If you want to climb the tower, tickets need to be purchased well in advance. If you are looking for that gargoyle silhouette shot with the river Seine and Eiffel tower in the background, then this climb is a must! 10 euros. 3) Go into the treasury of Notre Dame which is located inside the cathedral. Here you will find manuscripts, crosses, crowns and other sacred religious objects. 3 euros. 4) Visit the crypt and explore the historical ruins underneath Notre Dame. The entrance for this in in front of the cathedral. 7 euros. 5) Take photos in Square Jean XXIII, located behind the cathedral. This vantage point gives you a beautiful view of Notre Dame. Remember my bit about eating sweet? Well, after your Notre Dame visit, you should absolutely get some ice cream at Berthillon Glacier, one of if not Paris’s best ice cream shop. 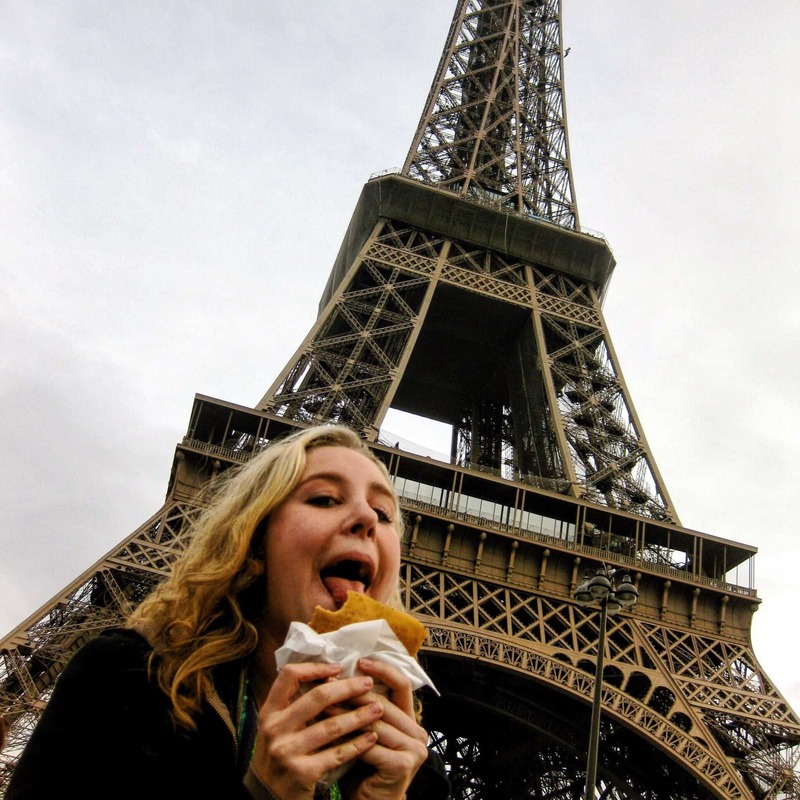 You get a free pass to eat ice cream at any time of day in Paris. The shop’s address is 29-31 rue Saint-Louis en I’le and once you get your scoop(s), walk along the riverbank and sit alongside the Seine. If you are looking for lunch after your Notre Dame visit, there are tons of fabulous restaurants nearby, which I would suggest looking up beforehand if you don’t have an international data plan. Some ideas include: Le Tournebievre, Au Vieux Paris, Le Petit Chatelet, and Au Bougnat. At this point, you will want to walk down the Seine with the end goal of getting to the Musee d’Orsay. Along the way you’ll pass Shakespeare and Company on Paris’s left bank. You’ll also go by some of Paris’s most famous bridges including Pont Neuf and the Pont des Arts (the famous love lock bridge). While most of the locks are gone, there are still traces around the area. If you are just doing a quick viewing of Notre Dame, you will probably also have time to see the Luxembourg Gardens before your next museum visit. It is a beautiful park with flower gardens, fantastic water features, and plenty of chairs available to relax and enjoy the views. You will want to give yourself a good amount of time at the Musee d’Orsay. I am not an art fan, but still absolutely LOVE this museum because it truly is the creme de la creme of art. There is a large collection of Degas ballerina dancers, Manet and Monet, Seurat’s pointillism paintings, Renoir, and Van Gogh’s Starry Night. Quite the lineup! Even the architecture of the museum itself is astounding as the building used to be a train station, the Gare d’Orsay. Tickets can be purchased online through the Musee d’Orsay website for around 13 euros. If you are wondering why I have barely even mentioned the most iconic landmark in Paris yet, trust me when I say I have plans to do it justice. For dinner tonight, I recommend eating at the restaurant on the first level of the Eiffel Tower, 58 Tour Eiffel. There are two seating times, one at 6:30 PM and one at 9:00PM. The prices are not cheap (around 100 Euros per person), but having dinner in the Eiffel Tower is an experience you won’t forget. Starter, main, and dessert are included as well as a welcome glass of champagne. You will have to pay for a lift ticket to the first floor, but you won’t have to stand in the long tourist lines to see the tower. There is another restaurant in the tower that is even pricier, La Jules Verne, so if this is a once in a lifetime trip (honeymoon? ), then you could consider that as well. Watching the Eiffel Tower sparkle at night is one of the most beautiful moments, so make it a point to be inside the tower when that happens and then eventually make your way post-dinner out from the tower to watch the Tour Eiffel light up from the ground. 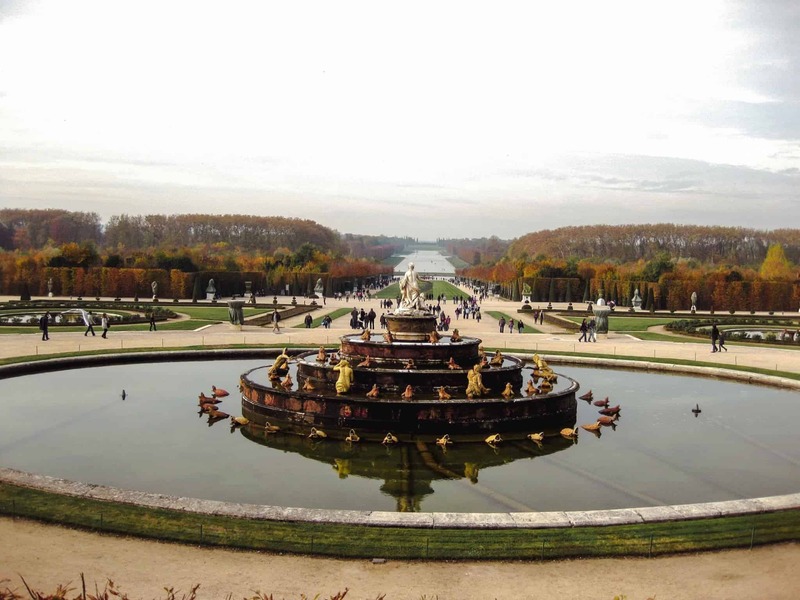 The most popular day trip in Paris is to the palace of Versailles, about 20 km southwest of Paris. With popularity comes large crowds, so it is important to be knowledgable about what you want to see ahead of time, purchase your tickets prior, and set expectations that things may not go perfectly as planned and that is okay. First things first, your day definitely won’t go well if you decide to go on a Monday because Versailles is closed. If Day 3 of this Paris itinerary falls on a Monday, switch it with Day 4! The best way to get to Versailles from Paris is by train. Take the RER C line from Central Paris for about 45 minutes to Versailles Rive Gauche. Your metro pass won’t work for this trip since Versailles is outside of the city, so you will need to purchase a separate roundtrip ticket for 7.10 euros. 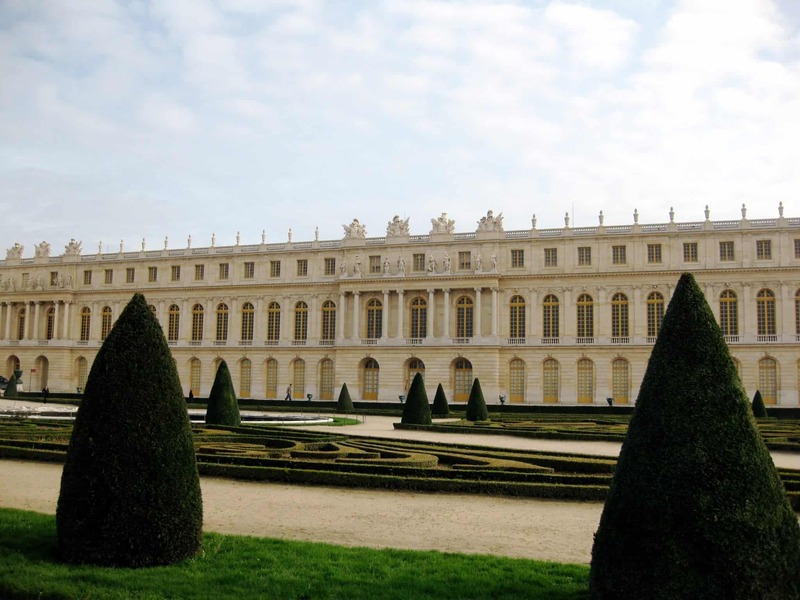 What should you see at Versailles? One way to guarantee yourself a miserable time is to plan on seeing everything on the property—it is 2,014 acres. The highlights are the main palace, the gardens, and Marie Antoinette’s estate, the Estate of Trianon. I highly recommend purchasing the Passport ticket from the Versailles official website which is typically around 20 euros and includes all of the above attractions. However, on the days of Musical Fountain Shows or Musical Gardens, the price increases to 27 euros. Fountain shows do happen most days during high season. Consequently, if you come on a day where the shows are happening, make sure you plan to visit the gardens around the times that the fountains shows start. Highlights in the palace include the Hall of Mirrors and the King and Queens Apartments. One important thing to keep in mind: Don’t spend too much time in the palace unless seeing Versailles is your dream come true. Grab a free audio guide but don’t listen to the whole thing or you’ll get burned out before you even make it to the gardens. This happened to me and when I finally made it outside to the gardens, I was so struck by the beauty but struggling to walk around. I didn’t make it too far out around the grounds before I skipped the Estate of Trianon altogether and got tired and hungry and walked to a restaurant in the town of Versailles. Once you get back from Versailles, you will probably want to rest and hang at your hotel until dinner. If you are looking for something a little bougie (because dinner in the Eiffel Tower wasn’t fancy enough) then you should head to Bar Hemingway at the Ritz Carlton right when it opens at 6:00 PM. The cocktails are 30 euros each…yes, that is insane…but the service here is amazing. You will be asked a couple of questions upon arrival in relation to drink preferences and out comes a perfectly crafted cocktail. One, might I add, that will undoubtedly be super strong. As good as the drinks may be, ultimately you are coming here for the experience. Perhaps one way to counterbalance the 30 euro cocktail is by picking up some falafels from a Doner Kabob shop for dinner. Otherwise, there are many fabulous restaurants in Paris to choose from. 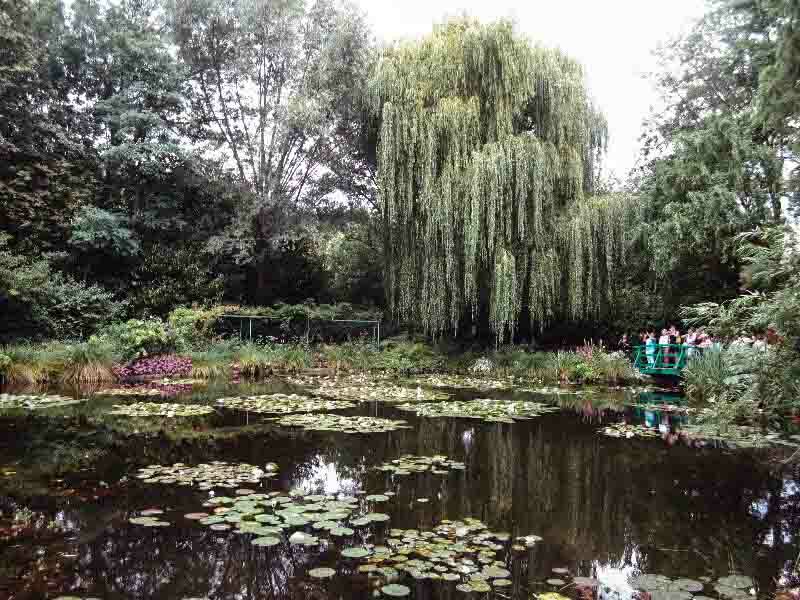 One day trip that is not quite as popular as Versailles, but having done it myself, strongly feel that it should be included on a trip to Paris, is a visit to Monet’s house and garden in Giverny, France. 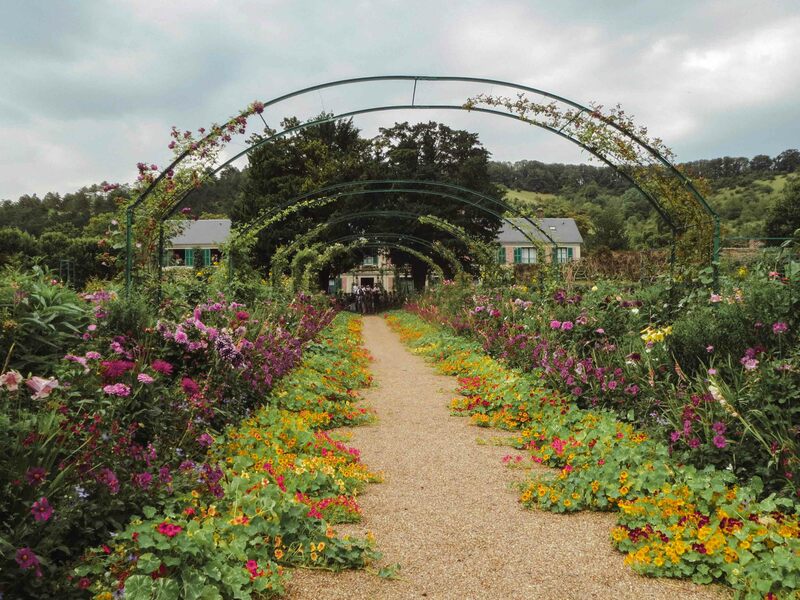 Only on a visit to Giverny will you truly understand Monet’s inspiration behind some of his most famous Impressionist paintings. The water lilies, flowers, and the Japanese bridge in his garden all served as his backdrop for so many paintings. Giverny is about 80 km outside of Paris. You can hire a private guide, rent a car, or take a train to get there. I went with a guide and a small group tour. Pickup was at the hotel and we did not have to wait in line to get into the house and garden. We also saw some other sights in the town of Giverny after the home and garden tour (which is self-guided btw). If you are driving to Giverny, the fastest way will take you via toll roads that can cost an exorbitant amount of money. So, if you do decide to drive, make sure that you set your navigation to avoid them and take the country roads instead. If you wish to take the train, take the “Grand Lignes” from Saint Lazare train station in Paris to Vernon. It is about a 45 minute ride and once you arrive in Vernon, you will take a shuttle bus straight to Giverny (8 euros roundtrip). Monet’s Garden is open from March to November from 9:30 AM to 6:00 PM. Tickets are 9.50 euro and you should purchase online in advance. I have heard that it is best to visit during the late Spring (May and June) when the flowers are in full bloom; however, I was there in July and it was still absolutely stunning. You will make your way through the garden, past the lily ponds, over the Japanese bridge, and become your very own flower expert in a very short amount of time. Once you have 100 or so photos of flowers on your phone, you’ll be able to enter Monet’s charming abode. 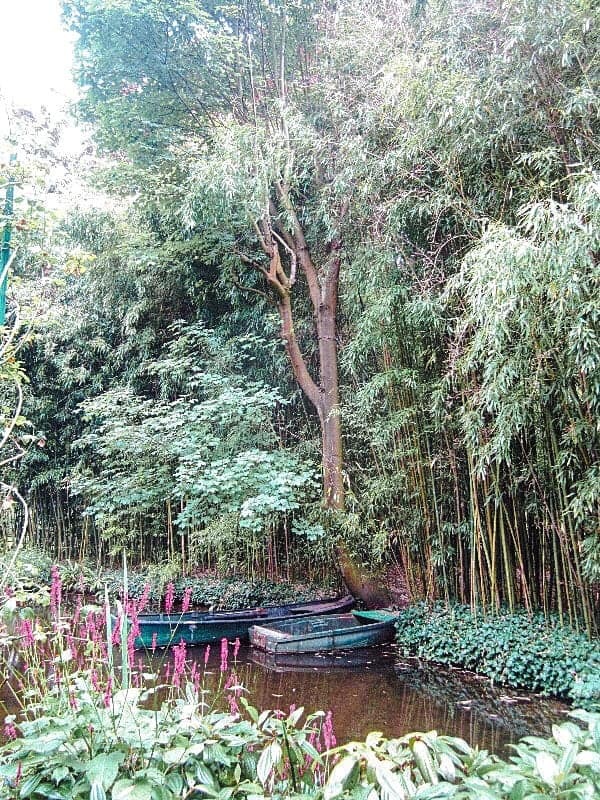 You can spend some time exploring Giverny before heading back into Paris for the evening. 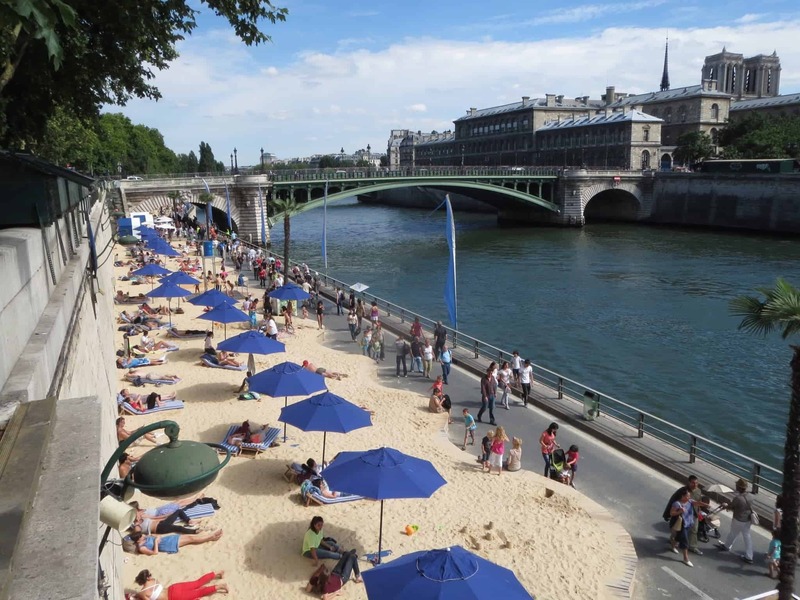 If you are visiting during the summer, it would be a great time to spend at the Paris Plages, the free beach on the riverbank of the Siene. Have a drink or two at Monsieur Mouche, a very posh cocktail bar on the Siene overlooking the Eiffel tower before retiring to your hotel for the final day in this Paris itinerary. While exploring Paris, you want to leave at least one day for semi-relaxation where you can actually take in the moment and appreciate your surroundings. Also, if you feel as though you missed out on seeing any particular Paris attractions—Galeries Lafayette, Paris Catacombs, etc. –today would be a great day to plan a visit. 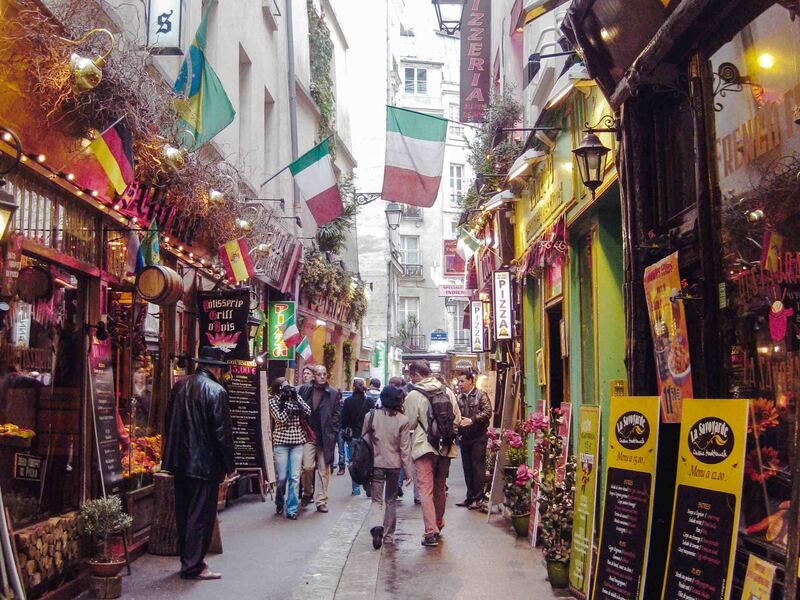 Start off your leisurely morning in Le Marais, a historic district in Paris with tons of retail shops, restaurants and cafes where you can grab a cup of coffee and watch the world go by. Do a bit of shopping and enjoy this revitalized neighborhood which regained prominence after falling into disrepair after the French Revolution. Today, it is one of the most trendy and charming parts of Paris. Afterward, you will want to make your way to the Tour Eiffel because we really didn’t get to appreciate the tower in all its glory during the light of day. Find a charming French street nearby to pick up some picnic goodies and situate yourself in the Champs de Mars, the large park in front of the Eiffel Tower. I will say it over and over again, but picnicking with some wine, a baguette, brie, and chocolate in front of one of the world’s greatest monuments, is truly one of the best memories one can have in Paris. Make sure you take photos at the Trocadero, the best vantage point and photography spot for the Eiffel Tower. We will round out the final evening of our Paris itinerary with a trip to Montmartre for one last incredible view of Paris from the Sacre Coeur. The neighborhood of Montmartre is incredibly photogenic; you should pass La Maison Rose, Le Consulat Restaurant, and Place du Terte on your way toward the basilica. The Sacre-Coeur Basilica sits atop the highest hill in Paris, and from here, you can watch the sunset. 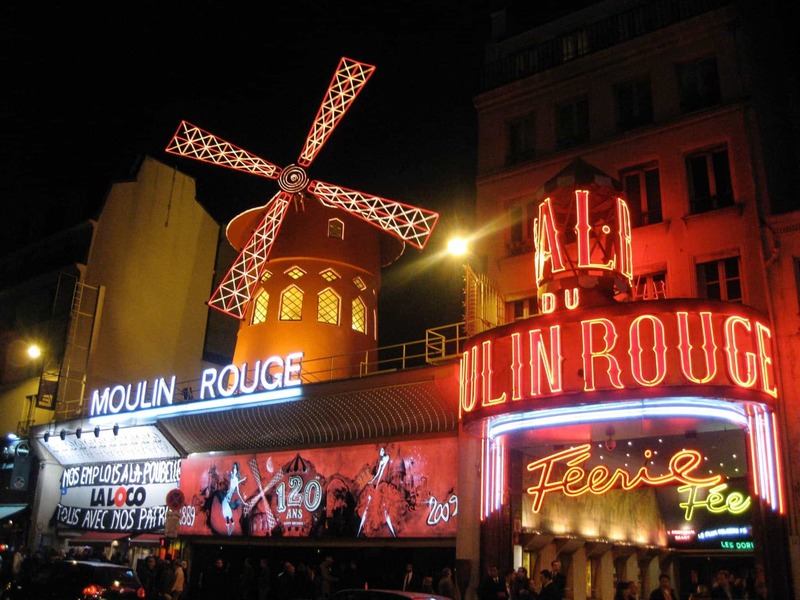 We have got to end the trip with a bang and where better to do so then the Feerie show at the Moulin Rouge. There is a possibility of dinner at 7:00 PM and two shows at 9:00 PM and 11:00 PM nightly. Come What May! Have you spent 5 days in Paris? Please share your thoughts on this Paris itinerary or ask any questions below in the comments! Are you on Pinterest? Save this Paris Itinerary for later! This Paris Itinerary post contains affiliate links. That means I receive a small commission if you make a purchase after clicking the link. Did you like this post? Please follow me on Facebook for more updates!